This striking portrait, "General George Washington Receiving a Salute on the Field of Trenton" was engraved by William Holl (1807-1871) after the painting by John Faed. It was published circa 1860 by the Kendall Bank Note Company, New York, N.Y. The engraving shows Washington traveling through Trenton, New Jersey, on his way north in 1775. Local citizens and dignitaries would often admire Washington as he rode through towns on his way to and from Mount Vernon. He would return in late 1776 for the decisive Battle of Trenton. This full-length equestrian portrait is a celebration of Washington's military prowess. General George Washington sits atop his horse, holding his cap in one hand and an outstretched saber in the other. His horse wears a leopard skin saddle blanket. Washington's visage is based off the famous Gilbert Stuart Athenaeum portrait of Washington. Washington's facsimile signature is boldly depicted in the piece's border. John Faed (1820-1902) was a prominent English painter who made several portraits of Washington in the course of which he modified the face using both Trumbull and Stuart. 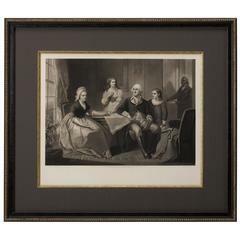 The print is elegantly framed using the finest archival materials and techniques, as is only fitting for our nation's first President. 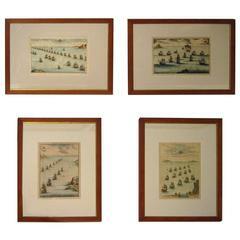 Framed size 40 3/8" H x 32 3/4" W x 2" D.
By Cecil Charles Windsor Aldin, R.B.A. Cecil Charles Windsor Aldin, R.B.A.